There are 38 study rooms in the John C. Hitt Library. The rooms are of various sizes to accommodate 2, 6, 8, 10, or 12 people. Each room has a data jack and electrical outlets. This proposal seeks funding to outfit all the study rooms with technology. Three equipment packages have been created and numbers of study rooms identified to be equipped with each package. One additional unit is proposed as a mobile solution to be used around the library. Package 1 will include Dell AiO (all-in-one) PCs with an Intel Quad Core i7 processor, 8GB RAM, 128GB SSD, 23” display, integrated webcam, and 5 year warranty. They will be configured like the other public computers in the building, connected to the network and secured in the room. Twenty-three study rooms will receive Package 1. Package 2 will include an Epson Brightlink Pro 1410Wi digital whiteboard that will allow students to project their work onto the writable surface, work collaboratively, makes notes, highlight and edit on the projected image, share work, email and save. Eight study rooms will receive Package 2. Package 3 offers a 46” LED screen for users to connect via their own laptops, tablets or other devices by cable to project on the screen. Six study rooms will receive Package 3. Finally, a mobile cart with a projector and whiteboard will give students the flexibility of taking collaborative technology wherever they need it in the library. This would be especially useful for those times when larger groups need to gather on the 3rd floor and a study room is not available or appropriate. Users will connect their own devices to project onto the screen. State the number of students that will simultaneously benefit from the proposed project. If all the study rooms are filled to capacity, 240 students would simultaneously benefit. The study rooms can be reserved for 2 hours. There is an online reservation system to accommodate the continuous demand for rooms. The mobile cart will be reserved for 2-4 hours with varying numbers of students using it. Larger groups of 10-12 will most likely use the mobile cart. Will access be full-time (7×24)? The rooms are accessible the hours the library is open (105 hours a week). The numbers were compiled by multiplying the number of study rooms by their capacity and adding them all and estimating the size of group using the mobile cart. The study rooms in the John C. Hitt Library are extremely popular but the one suggestion submitted over the years to make them better is to add technology to them. Each study room was wired to add technology many years ago but equipment and network management was not as sophisticated and security was a concern. That has changed and the kinds of technology that students find useful in collaborative study has changed as well. The equipment proposed will provide computers that students can utilize to work collaboratively. Through the use of the interactive whiteboard, the 46” display, and the mobile cart, they will also have the ability to display their work in a larger format, discuss it, edit it, and save it to their storage space whether flash drive, campus network drive, or a cloud alternative. Access to PCs and other technology tools available in a team setting will be useful preparation for their future in the workplace. Study room use statistics are routinely gathered. Use by room and by technology package will be measured and evaluated on a monthly basis. 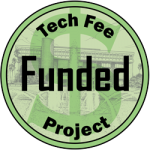 The UCF Libraries does not have a technology budget so it looks to technology fee funding to implement new resources. This funding will make possible the much needed addition of equipment in all the study rooms in the John C. Hitt Library. The equipment will be purchased with extended warranties and will be installed and maintained by the Libraries’ IT staff. Each package described below includes the main piece of equipment and all the cabling, security parts, and accessories needed for the installation. The study rooms receiving the package are included in the description. 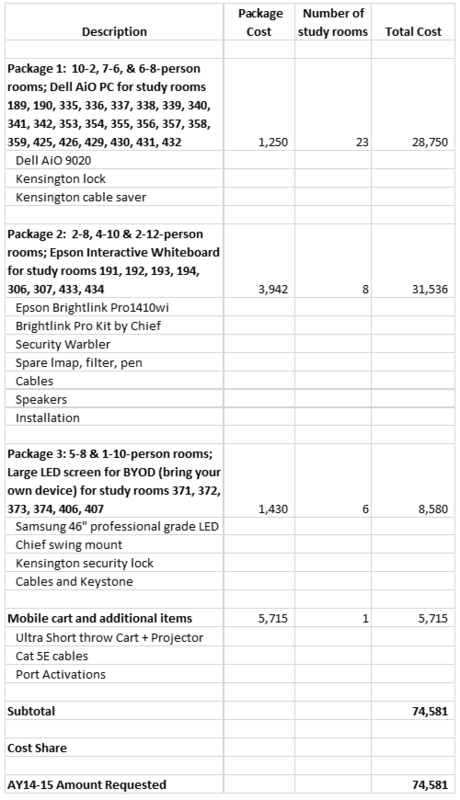 The final item, Mobile Cart and additional items, includes the cost of the cart as well as the cables needed for connecting all the equipment in the proposal to the network and the cost of activating the ports in the study rooms. Package 2 was not funded. Total award for the remaining items is $38,045.00.